Unipublic, the organiser, finally yielded to pressure from other cyclists, including Tour de France winner, Chris Froome, who had criticised the safety of the route especially around the Rio Verde. Unipublic did not consider that racing across a wooden bridge and a path laid over sand would be a problem, until riders including Froome tested the stage between Puerto Banus and Marbella Marina. Their complaints had nothing to do with a bad condition of this section, but with the problems of crossing the sand at speed. The decision was taken this morning at a meeting between Unipublic, with its director, Javier Guillen as well as riders, who has decided to cancel the times for the overall result. It has ruled out the option of changing the route based on traffic and the lack of time to make a new plan. Spandau Ballet have been forced to cancel their concert due take place at the Hotel Puente Romano Tennis Club this Friday August 21. John Keeble, drummer for the iconic 80s band has been taken ill and forced the cancellation of shows scheduled in Marbella, Sant Feliu de Guixois and Ibiza. Promotors Musiserv have advised that any tickets purchased for the Marbella show will be refunded at the orginal point of sale. Tickets brought via Ticketmaster and El Corte Ingles will be refunded using the same credit card used for the purchase, and fans who brought tickets vias the ticket hotline should call 664 475 590 for instructions on how to get their refunds. The 40 Hot Mix Tour of 40 Principales, the national Spanish Pop radio station, will feature liveperformances by Calum, Dasoul, (pictured), Lucy Paradise , Amelia , Carlos Jean, Mario Jefferson and Paula Rubio and many others . Hosted by DJ Oscar Martinez ,the show takes place at the Boulevard San Pedro this Wednesday, August 19 as part of a nationwide tour. The action starts at 22.00 and runs until 02.00 am, so expect lots of teen and tweenie screaming! 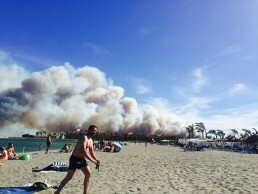 Two large wildfires swept the Coast and were clearly visible from Marbella over the weekend. A huge fire in the Campo de Gibraltar forced the evacuation of some residents in Torreguadiaro area and also threatened luxury properties in the exclusive Sotogrande area. Roads were closed and fire fighting 'planes and helicoters dramatically scooped water from Mediterranean as they tackled the blaze, which reportedly started near Alcaidesa. A second fire also started in the Riviera del Sol area. First reports indicate that a woman has been arrested for deliberately starting the blaze. The month of August is traditionally high season for fires. This year's dry winter has also added to the problem. “Summertime and the living is easy” – and while this may have been true for Janis Joplin (and after her usual two bottles of Jack Daniels she normally was pretty easy) for those of us living on the Coast the days from now until September 1 are a Hawaiian-Tropic drenched assault course. I have to use my razor-sharp elbow technique and the dark cunning of the French Rugby front row to get to the bar at my favourite watering holes, the supermarkets are full of English tourists who think that Bimbo bread is the funniest thing that they’ve ever seen and that the checkout girl is trying to short change them because they’ve never seen a Euro before, and getting around is more fun than usual because trying to get a taxi is like trying to get on the last helicopter out of Saigon. Meanwhile the good citizens of Madrid descend on the roads, indulging in their favourite trick of driving very slowly and then suddenly stopping, turning left without indicating or a combination of both. And just to add a little spice to the mixture is the usual rag-tag convoy of dog-tired Moroccans trying to make the ferry to Algeciras and who have usually been driving for 36 hours nonstop in beaten up Peugeots with the extended family in the back, what looks like the contents of the house on the roof and the granny stuffed muttering in there somewhere as well. As an old hand at surviving the summer in Marbella, here are a few tips that I have found invaluable. Even though I live in a cottage on a lake, I never normally subscribe to the trendy mantra that staying in is the new going out. But during summer it can help to “go a little Garbo” and give free rein to your reclusive side. Don’t move further than the fridge, TV or pool. Catch up on your reading, sit through that boxed set of “Game of Thrones”, download those long forgotten CDs to your iPod, try and conquer the latest games on your games console or cultivate your culinary side by becoming a BBQ master. It’s a great excuse to throw on a silly apron, get a couple of mates over and throw some shrimps on the Barbie. If the thought of lying on a sun lounger reading the latest airport blockbuster fills you with dread, fear not. Marbella has more than enough air conditioned art galleries for culture vultures. These include the Museo Miraflores and the Museo de Grabado housed in the old hospital in the old town that hosts an outstanding collection of contemporary Spanish engravings. Check out the Museo Ralli next to the Coral Beach Hotel as well, that houses a large and fascinating collection of contemporary South American art, as well as work s by Dali and Chagall. It has great air con too! While the rest of Spain is sweltering on the beaches, why not head inland and discover some of Andalucía’s most beautiful towns and villages? Ronda is a firm favourite, with great bars and restaurants and the dramatic Tajo gorge and bridge spanning it. The blue Smurf village of Juzcar just off the Ronda road is certainly different, while the village of Benojan is home to the renowned hotel and restaurant Molino del Santo. If speed is your thing, check out Andalucía’s largest go-kart track at Campillos or Spain’s lake district with the fabulous lakes and climbing of El Chorro, home to the newly opened walkway, El Camino del Rey. And if you just fancy a little history, try Antequera, located dead centre in the heart of Andalucía, which has more churches and chapels per square metre than any other town in Spain and the famous “Indian’s Head Rock” where legend has it that a pair of doomed lovers, one Christian, one Muslim, leapt to their deaths. So if you are looking for something other than sun, sand and sangria, take our tips and keep your sanity this summer! In the latest in a growing number of anti-bullfighting protests Marbella-based animal activist Virginia Ruiz leapt into the Malagueta bullring on Friday to comfort a dying bull. Ruiz ran between the bullfighter and the stricken animal, despite having insults thrown at her and being spat on by the crowd. She was eventually led away from the ring and the bull was killed. Although entrance to the Malaga Bullring was free on Friday, video taken at the event show a sparce crowd at the Malagueta, a sign that bullfighting is no longer popular amongst modern Spaniards. Marbella Town Hall has announced that it will develop an "innovative and ambitious" plan of LGBT diversity. Different municipal offices will work together to ensure the rights and well-being of lesbian, gay, transgender and bisexuals in the municipality. 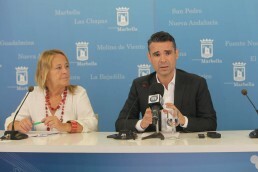 At a press conference mayor of Marbella, José Bernal, said that the plan was based on the principle of equality and would be co-ordinated by the Department of Equality and Diversity under Ana Leschiera, but with the participation of other municipal areas. Councillor Ana Leschiera added that it was a living plan that would have the collaboration of different associations and was based on twelve areas of action. These include prevention, which is based largely on awareness workshops and culture, as well as addressing LGBT issues in sport and tourism. Marbella Town Hall will be holding a series of events and campaigns highlighting the work of LGBT individuals, associations and movements in the next few months. 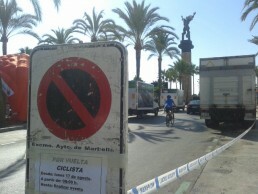 The giant inflatable Coke can has been one of the most recognisable images in Marbella, and its go karting track has inspired the dreams of thousands of would be Fernando Alonsos over three decades, but yesterday Marbella Town Hall closed one of the most popular beaches for families when it locked the gates of Funny Beach. 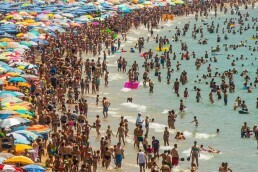 Marbella Town Hall claims that owner Horacio Helmann has been violating planning laws since Funny Beach opened in 1990. The go kart track was deemed illegal on what is green zoned land, and Funny Beach had been allowed to operate on a temporary licence since then by previous town hall administrations. Yesterday's closure left eight Funny Beach employees out of work at the height of the summer and hundreds of children, who had come for a day of go karting, dissapointed. The Town Hall may be following the letter of the law on closing Funny Beach due to it using tempoarary licences, but closing a well know family friendly beach club, popular with both locals and tourists alike has already proved an unpopular move. Especially when you consider the loud music, and drunken stag and hen and champagne spraying parties that are allowed at other beach clubs. For a Marbella Town Hall that wants to draw attention away from the TOWIE and Life on Marbs crowd and promote more family friendly locations, closing Funny Beach seems a strange decision. Planet Marbella makes the small screen! Marbella's TV station, RTV, will be running an interview with Planet Marbella this Thursday! Nicole King, the bubbly host of RTV's Marbella Now programme, interviewed Planet Marbella founder Giles Brown at the Grand Melia Don Pepe Hotel earlier in the week. In the interview Giles talks about the idea behind Planet Marbella, as well as discussing a number of issues and stories from the blog with Nicole. Marbella Now is on RTV on Thursday August 13 at 7.30pm. Between 70 and 130 children a day in Marbella are benefiting from the Junta de Andalucia's Solidaridad y Garantía Alimentaria programme that runs during the summer holidays. The programme focusses on three groups. One is for children in groups that are deemed at risk of social exclusion, another for people on low incomes and a third is a home delivery service for those over 65 who are on low incomes and unable to visit their local social centres. In Marbella the food distribution for children is organised by the Undebel Villela local association using the facililties of the Rafael Fernández-Mayoralas college. Marbella Councillor for Social Rights Victoria Morales visited the college to see the programme at work at first hand, going out with the association to buy food from local businesses and later help in preparing breakfast. Morales explained that the programme will run throughout the summer and was open to all those that qualified for aid. The school canteens have fed up to 120 on one day, although the number is usually slightly less. On the day of the Councillor's visit, the centre provided breakfast for 75 children.